The Celebration of the Peace of Münster by Bartholomeus van der Helst, 1648. Early in this book, author Brendan Simms, professor of history at Cambridge, quotes John Locke: "How fond soever I am of peace I think truth ought to accompany it, which cannot be preserved without Liberty. Nor that without the Balance of Europe kept up." As Simms indicates, for Locke, "truth" was defined as Protestantism and parliamentary government, while "the Balance of Europe" referred to the security of the German territories in its heartland. The larger significance of Locke's comment is the basis of this sweeping and provocative volume. In Simms's reading, the peoples of Europe long required the preservation of "German liberty," meaning the autonomy of the German princes against the Habsburg Austrian rulers of the Holy Roman Empire. Germany was therefore the recurring battleground—during the Renaissance as well as the "revolutionary age" that began in the 17th century—for, successively, the Habsburgs, England as a partner for the Habsburgs, the French, and Russia. Simms argues that the foreign strategies of the powers were inextricable from their domestic policies. Linkages between peace or war and liberty extend, in his view, through every armed conflict and political upheaval since the Ottoman conquest of Constantinople. Moreover, Simms's attitude toward the relation between internal freedom and foreign affairs is relevant to the current ideological debate in the West, between the supporters of global intervention and its opponents. In discussing the Peace of Westphalia, which ended the Thirty Years' War in 1648, Simms offers a novel interpretation of its lasting import: He affirms that it "has been seen by generations of international lawyers and international relations theorists as the breakthrough for the modern concepts of sovereignty and non-intervention in the domestic affairs of other states." But, he declares, "the whole purpose of the treaty was to guard against German princes exercising an untrammeled sovereignty" over their differing Catholic and Protestant believers, and "the Westphalian treaties were nothing less than a charter for intervention." Simms also justifies "strong central government with tax-raising powers," amplifying a common English argument, heard at the end of the 17th century, that "a free people require a strong and expensive state." Simms discloses connections between wars that appear distant, but which were fought to achieve the same end. Issues joined far from Central Europe were, for Simms, extensions or reflections of the challenges in the middle of the continent. To cite one instance, he explains that a Russian war against the Ottomans in 1736 "was intended in large part to create an alternative imperial legitimacy to that conferred by the Holy Roman Empire." With the Habsburgs reigning over the Empire, none of the other European powers anticipated a new, major factor emerging in Prussia under Frederick II, who gained the throne in 1740. Prussia seized Habsburg territory in Silesia (today mainly in southern Poland), but the Habsburg Empress Maria Theresa summoned a defensive force, and her dominion survived, although she lost most of Silesia. Four main European states—which remain such to the present—had by then assumed supremacy: Great Britain, France, Russia, and Prussia, the latter as a united Germany after 1871. German echoes were present in every succeeding world crisis. Once America achieved independence, European problems occupied the American Founders, and Simms presents the constitutional debates in The Federalist as deeply marked by the bad example of decentralized authority in the German states. In France, hatred of the royal consort Marie Antoinette, born a Habsburg princess, and rejection of a French alliance with Habsburg Austria contributed to the disintegration of the Bourbon monarchy. The French revolutionary regime turned against Austria and invaded the Holy Roman Empire; Napoleon, taking leadership of the French, fought against Austria, Prussia, and their protectors, Russia and Britain. Napoleon overcame Prussia and demanded that the Habsburgs surrender their claim over the Germans. He compelled the dissolution of the Holy Roman Empire, after nearly eight centuries, while Germany was reorganized and the process of its unification begun. Ultimately, Napoleon was defeated in 1815, but, as Simms attests, a new European order had come into existence. The end of the Holy Roman Empire was a "third revolution," after those of America and France, in which the Central European equilibrium was overthrown. The remainder of this encyclopedic account depicts the convoluted consequences of the long and innumerable battles for the European heartland. The Congress of Vienna curbed French radicalism, temporarily, by restoring the monarchy; the Holy Roman Empire was replaced by a German Confederation. In 1866, Prussia expelled the Habsburgs from the confederated German territories, and the ground was laid for a single Germany—although by then America and czarist Russia had become the arbiters of world politics. In 1870-71, Prussian-led Germany administered a disastrous military defeat to France and proclaimed a German Empire. Germany had grown to be the de facto leading Western European power, acquiring colonies in Africa, the Pacific, and China. Germany built a navy intended to rival the Royal Navy, which had long "ruled the waves." In 1914, after numerous incidents of tension between Germany, on one side, and France, Britain, and Russia on the other, came the first of two world wars, in which Germany and its Austrian and Ottoman allies were routed. This outcome yielded the rise of Bolshevism and, subsequently, National Socialism. As Simms comments, "The war against Germany was over; the struggle over Germany now began." Germany was prostrate, but was refashioned as a totalitarian state under Hitler. In the second round, Germany was again vanquished, along with its new allies, Italy and Japan; but the rest of the world had relearned that the stabilization of Germany was necessary, even absolutely necessary, for the peace of Europe. The United Nations, crucial to the process of German rehabilitation, was founded as an official international institution and, as Simms remarks, was "at its creation . . . a highly interventionist body. The fetishization of state sovereignty for which it later became known was a subsequent re-invention by Third World-ist dictators and unworldly international lawyers." Most significant, France and Germany were reconciled by economic agreements culminating in the establishment of the European Union. West Germany, occupied by the United States, Britain, and France, was inducted into the North Atlantic Treaty Organization; East Germany, controlled by the Soviet Union, was exploited but not completely impoverished by Moscow. Still, in 1989, East Germany collapsed, soon followed by the rest of the Communist states in Europe. Germany was reunified, and its currency was eventually assimilated into the euro. As Simms recalls, "The German mark was to be sacrificed as the price for ending the partition of Germany." Simms previously published Unfinest Hour (2002), an outstanding critique of British passivity toward Serbian aggression in the Balkan wars of the 1990s. In discussing that decade in Europe, he also condemns, severely but accurately, the EU's failure to defend Bosnia-Hercegovina—though he acknowledges that NATO acted expeditiously in Kosova. Today, Germany dominates EU fiscal policy amid the greatest economic crisis since the 1930s. As described by Simms, Germans are disillusioned with the common currency, and many favor an exit from the eurozone. Elsewhere in Europe, this has "provoked a popular anti-Germanism unknown since the late 1980s. . . . The German Question, eclipsed for more than a decade after unification, was back." 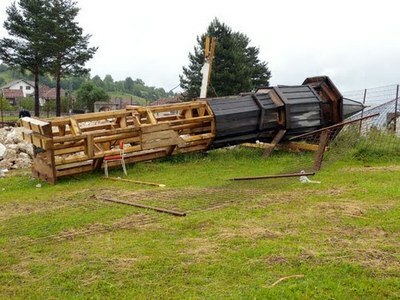 The war against Bosnia: destroyed wooden minaret at the mosque and tekija in Prusac of the Sufi and logician Hasan Kafija Pruščak (1544-1615 CE). The shrine has since been rebuilt.